Prime Minister Narendra Modi has assured his Bangladesh counterpart Sheikh Hasina about no adverse fallout of Assam’s National Register of Citizens (NRC) exercise on her country. Officials accompanying Modi told Northeast Now that the assurance was given during a one-to-one meeting between the two leaders at Kathmandu on the sidelines of the BIMSTEC summit on Thursday. The two-day summit begins on Friday. The officials said that the Modi’s assurance was ‘unambiguous’. That would mean, though not explicitly stated, that India does not plan to push back into Bangladesh anyone not finally included in the NRC. Bangladesh is headed for parliamentary elections at the end of this year and Hasina’s Awami League has been apprehensive of the shrill rhetoric unleashed by BJP-RSS leaders about ‘throwing out illegal infiltrators’. Seen as a friend of India, Hasina and her party which spearheaded the country’s liberation from Pakistan with Indian help suffers from a pro-Indian image and Islamist opponents accuse her of ‘selling out’ to India. India’s failure to finalize the Teesta waters sharing treaty has already disadvantaged Hasina considerably and now the possible adverse fallout of the NRC exercise has added to her discomfort in an election year. Indian High Commissioner in Dhaka H V Shringla has already assured Bangladesh Foreign Minister A H Mahmood Ali and top Awami League leaders that the NRC was an ‘internal exercise’ of India not to affect Bangladesh in any way. Now Modi’s assurance to Hasina comes as a much needed step to avoid any tension in an unusually friendly relation that has witnessed Hasina’s government deliver on all of India’s concerns from a fierce crackdown on north-eastern rebel bases and hideouts in that country to providing transit to the Northeast from the Indian mainland . 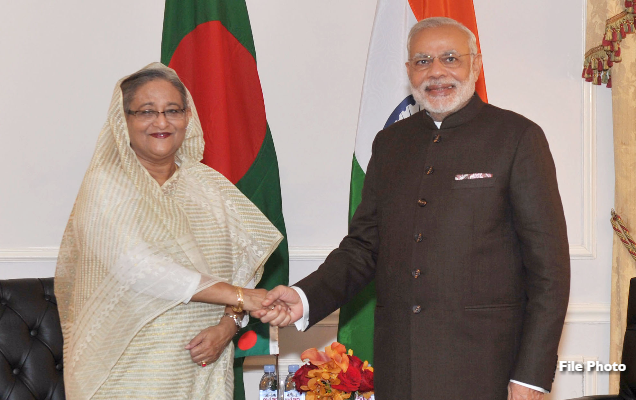 During the Kathmandu meeting, Modi also assured Hasina of total Indian support on the Rohingya issue. India is mounting pressure on Myanmar to take back the Rohingyas, one million of whom are now in Bangladesh, having assured Myanmar of Indian assistance in housing the returnees. The Awami League government is keen to get the repatriation started because the Rohingyas are a drain on Bangladesh ‘s economy and radical elements among them with links to Pakistan are seen as a security threat by Dhaka.